Iced tea with peaches and basil seeds. 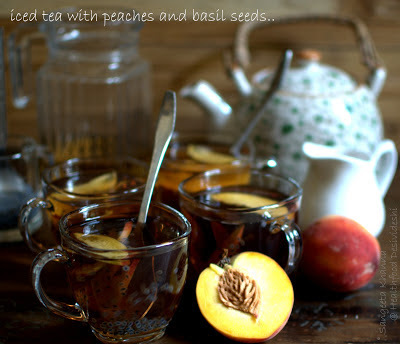 Cooling and refreshing fruity tea, something that fixes a screwed up day in just a few minutes. We recovered from a horrible summer just a couple of days ago. We all had lost appetite and one full meal in a day felt like too much, all the other meals were either raw salads, smoothie or clear liquids. 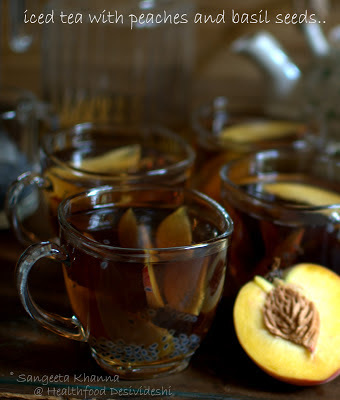 Teas are my clear liquids in all seasons, spiced, herbed hot or chilled. My tea can have just anything that suits my mood. Also, getting up and brewing a cup of sunshine is always a rejuvenating activity for me. 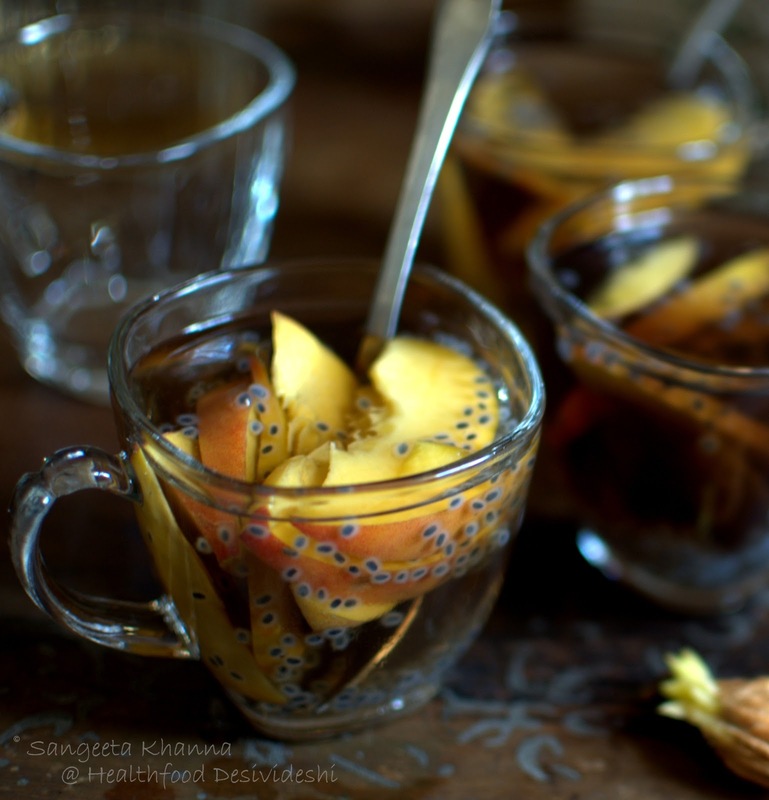 Adding more freshness in the form of fruits and herbs just makes the pleasure multiply. You would like this tea without ice or chilled or cold as well. The flavors are quite refreshing even without extreme cooling. I used a blend of green tea with himalayan tulsi and pomegranate flowers by Anandini and the tea itself is superbly aromatic. Adding the fruit and basil seeds enhances the flavors. You can always use regular kaali tulsi leaves and dried or fresh pomegranate flowers to brew this tea. Although blending the different herb flavors to your taste can be a skill you learn after a few trials. Brew a pot of tea with green tea blend that your are using. I am sure you know you have to place the tea in the pot first and then pour hot water over it, and cover the lid for 3-5 minutes. depending on how strong you want your tea. The hot water should be hot but not boiling, pour it into the kettle just when it starts bubbling. For this iced tea, cool the brewed tea and then pour in into glasses or mugs having the soaked basil seeds. To soak the basil seeds, just tip in 1/4 tsp dry basil seeds (subza) in each cup, add a tbsp of cold water and let it soak for 2-3 minutes. The seeds become plump and a white sheath appears over it. 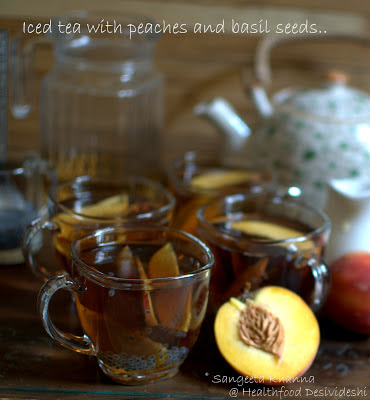 Pour the cold brewed tea over it, tip in the peach slices and some ice cubes if you like. Serve the tea with a dessert folk preferably, so the peach slices can be recovered. They taste great with the tea flavor seeped in and the subza seeds stuck to it's skin..
No need to add sugar to this tea. You wont miss any sugary sweetness in this tea. The fruity flavors will be killed once you sweeten it. A dash of honey works nicely if you feel you need a hint of sweetness. Add as much fruit as you wish. 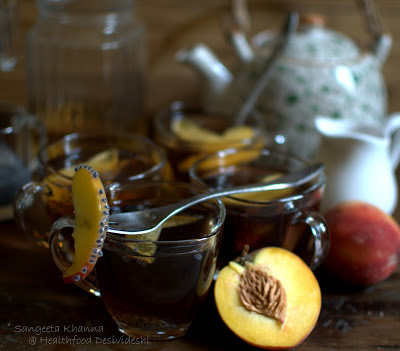 In fact I liked this tea with sliced plums as well. Combining teas and fruits or herbs is much much beneficial if you are aiming at detoxing your system naturally. I understand you know that already..